President William Howard Taft held many titles - President of the United States, Chief Justice of the United States, Secretary of War, Solicitor General, Governor of Cuba, and Governor of the Philippines, among others. Yet there is only one title which he still holds some 80 years after his death - fattest President. Many anecdotes have been passed down regarding Taft's tremendous weight. One of the most famous concerns him getting stuck in the Presidential bathtub and thus ordering a replacement - large enough to fit four average-sized men! Taft even had a new bed constructed at his friend Todd Lincoln's (son of Abraham) house because the springs in the original mattress broke under his weight. Yet, Taft was not always obese. He was a collegiate wrestler at 225 lbs. and by all accounts quite athletic. He steadily gained weight after graduating college, eventually ballooning to 320 lbs. in 1905, at which point he began his first diet. Before the era of diet books (let alone DVDs) and personal trainers, physicians often constructed and oversaw their patients' weight loss regimens. It is no surprise then that Taft enlisted the services of Dr. Nathaniel Yorke-Davies, a London physician, who created a personalized "reducing" diet for the War Minister. The diet consisted primarily of meat and vegetables and outlawed fruits, grains (except gluten-free biscuits), and sugar. In short, it was a low-carbohydrate diet. Taft presumably followed the diet because 6 months later he was a relatively svelte 255 lbs. Once at his target weight Taft adhered to Yorke-Davies' "stationary" or maintenance diet (the reducing diet plus some grains)...at least for a few months. It seems that in addition to dieting, yo-yo dieting also existed in the early 20th century. 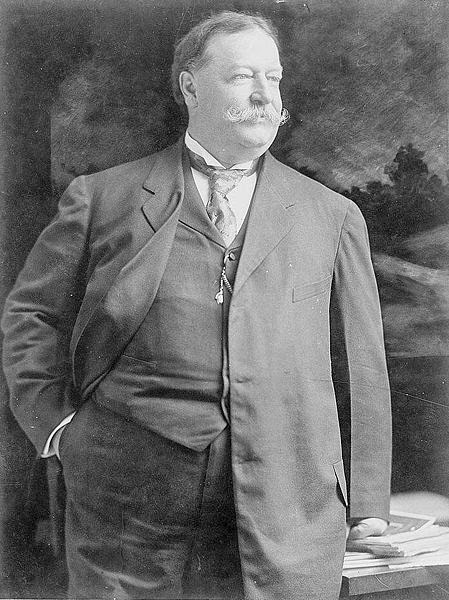 According to an account by White House mailman of over 50 years Ira Smith, Taft's appetite during his diet became so voracious that he once ordered that a train he was riding on be rerouted so that a dining car could be attached to it- at 10:00 p.m.! (read the full account of the incident here). Taft reached his all time high of 340 lbs. in 1913 and embarked on a second "reducing diet" shortly after leaving the office of President. After dropping to about 270 lbs., he managed to control his weight for the remainder of his life. President Taft in 1907, about one year after his first diet. Unfortunately for Taft, his characterization as a perpetually obese man was mostly a result of bad timing. Although Taft was one-half inch shy of 6 feet and close to 250 lbs for most of his life, his twin peaks of 320 and 340 lbs. occurred as War Minister and President, respectively (see chart below). And that is why he is remembered as the fattest U.S. President (among other things, of course). Note: Need a mnemonic device to remember the fattest President? Just rearrange the letters in "Taft" and you get "Fatt." Thats Just Mean. You People should be ashamed of yourselves. I was the anonymous person above. This Is quite cruel of you to publish for everyone on the planet to see. You people make me sick. To the person above its not like he's going to serf the web and read it. ...then he had a LOT of stress. pres taft , poor wife ellen, just think all that flab on top of her.....yuck! This isn't being mean, it's providing people with information about history, which is what this site does. Don't complain about a website doing it's job. maybe someone was looking for interesting facts about presidents, like me. I wouldn't learn the information without sites like these! His obesity has now be Trumped!